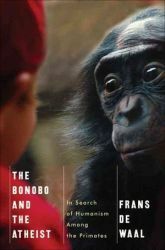 Frans De Waal asserts in The Banobo and the Atheist that primate morality predates religion and challenges nontheists to focus on reclaiming that priority rather than wasting efforts remonstrating against religion's putative usurpation. De Waal is no Voltaire and offers no cleaver aphorisms like "if God didn't exist, he'd need to be invented"1, but his reprove of adamant atheists is no less subtle—crusading castigators of the inventors and users of religion is an ineffective humanist strategy. De Waal seems content to assume everybody will realize that all inventions, including religion require periodic upgrading or replacement—he may be correct, but discarding delusions2 is unlikely to be so simple. UPDATED 06/03/2015 NG, In Age of Science, Is Religion 'Harmful Superstition'? Article seems to assume that religiosity implies turning to God or attending church. As with all things homo sapiens the more you know the less you understand—a complexity polls invariably fail to capture. 1. De Waal includes this Voltaire aphorism in a chapter preface. 2. Not an insignificant portion of our citizenry, including policymakers, professes prayer as an effective problem solving strategy. These same citizens and policymakers are also likely to assert that "you get what you pay for"--however delusional and ineffective as a problem solving strategy it has an apparent zero cost. Of course the actual costs of prayer are likely to be much more expensive as unsolved problems cascade in to chants, crusades and chaos.